Henry Holt and Co., 9780805094022, 368pp. 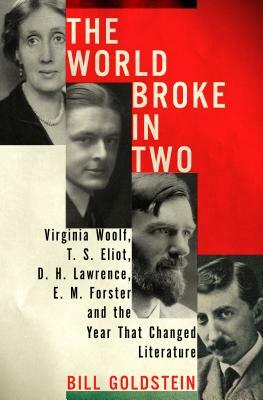 The World Broke in Two tells the fascinating story of the intellectual and personal journeys four legendary writers, Virginia Woolf, T. S. Eliot, E. M. Forster, and D. H. Lawrence, make over the course of one pivotal year. As 1922 begins, all four are literally at a loss for words, confronting an uncertain creative future despite success in the past. The literary ground is shifting, as Ulysses is published in February and Proust’s In Search of Lost Time begins to be published in England in the autumn. Yet, dismal as their prospects seemed in January, by the end of the year Woolf has started Mrs. Dalloway, Forster has, for the first time in nearly a decade, returned to work on the novel that will become A Passage to India, Lawrence has written Kangaroo, his unjustly neglected and most autobiographical novel, and Eliot has finished—and published to acclaim—“The Waste Land." As Willa Cather put it, “The world broke in two in 1922 or thereabouts,” and what these writers were struggling with that year was in fact the invention of modernism. Based on original research, Bill Goldstein's The World Broke in Two captures both the literary breakthroughs and the intense personal dramas of these beloved writers as they strive for greatness. Bill Goldstein, the founding editor of the books site of The New York Times on the Web, reviews books and interviews authors for NBC's "Weekend Today in New York." He is also curator of public programs at Roosevelt House, the public policy institute of New York's Hunter College. He received a PH.D in English from City University of New York Graduate Center in 2010, and is the recipient of writing fellowships at MacDowell, Yaddo, Ucross and elsewhere. Bill is the author of The World Broke in Two: Virginia Woolf, T. S. Eliot, D. H. Lawrence, E. M. Forster and the Year that Changed Literature. “Bill Goldstein, a wizard of words, has gifted us with a magical brew. Profoundly researched and filled with stunning connections, The World Broke in Two is brilliant, compelling, incisive. It transforms our understanding of modern literature, and the creative relationships of Virginia Woolf, T.S. Eliot, D.H.Lawrence, and E.M. Forster. Everyone interested in history, literature, life will enjoy and benefit from this dazzling work.” —Blanche Wiesen Cook, author, Eleanor Roosevelt, Volumes I, II, and III.